Are the SAT and ACT "equated" beforehand, "curved" after the test, or both? The answer may surprise you. Are the SAT and ACT truly equated beforehand only? Is the scoring curve for each test "predetermined?" That's what the College Board and ACT claim / would like us to believe, but historically, there is often what's called a "smoothing" a.k.a. "curve fitting" process after the test is nationally administered for the first time, when a significantly higher amount of student performance information is collected than in the initial equating effort, so the College Board / ACT have access to a much more sophisticated degree of data about the test, and additional "fine-tuning" adjustments can be made to the final scoring scale before student scores are released. Please note that after the first "national adminstration" (in other words, not a "pretest" or "experimental" version, but the main version) of a test form, the College Board / ACT have historically used the exact same curve for any future administrations of that form, regardless of student performance on those future administrations. As you can see from the below PDFs that you can click to download, this type of intentional pre-test and post-test manipulation of SAT scores (whether it is called recentering, redistributing, equating, smoothing, scaling or curving) has been going on for decades, and most likely continues today, when the vast processing power of computers means that there is no longer a limit on the amount of test-day data that can be processed in order to establish a fair scoring curve for each exam. Another term for a "fair scoring curve" is "equipercentile equating." https://www.ets.org/Media/Research/pdf/LIVINGSTON2ed.pdf (**read page 20 about "smoothing)," which is another word for curving). The word "scaling" is also used to describe this process. 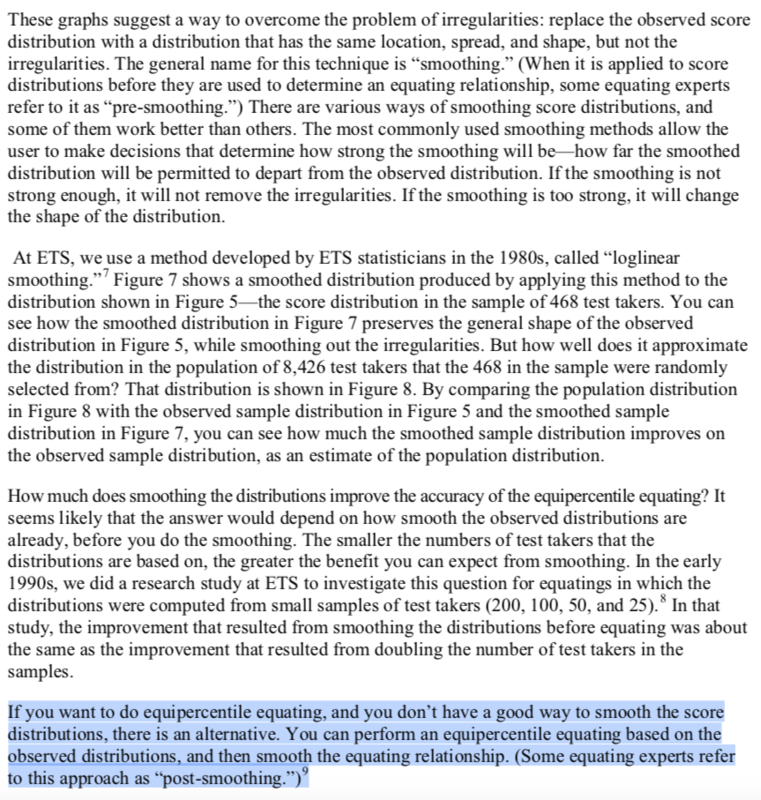 An excerpt: "If you want to do equipercentile equating, and you don’t have a good way to smooth the score distributions, there is an alternative. You can perform an equipercentile equating based on the observed distributions, and then smooth the equating relationship. (Some equating experts refer to this approach as “post-smoothing.")" "Unlike with item response theory, equating based on classical test theory is somewhat distinct from scaling. 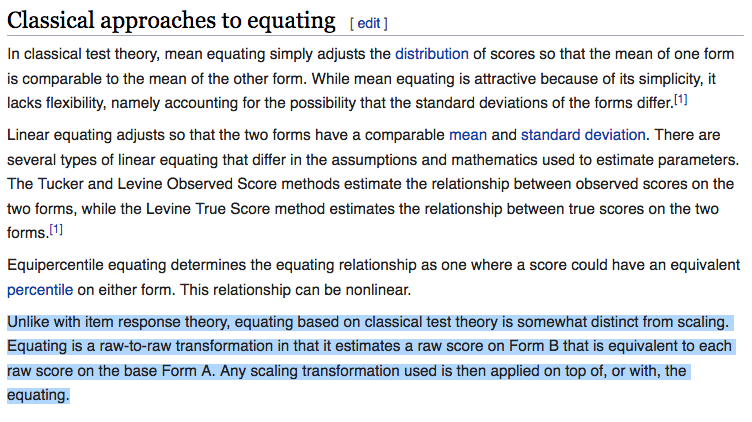 Equating is a raw-to-raw transformation in that it estimates a raw score on Form B that is equivalent to each raw score on the base Form A. Any scaling transformation used is then applied on top of, or with, the equating." 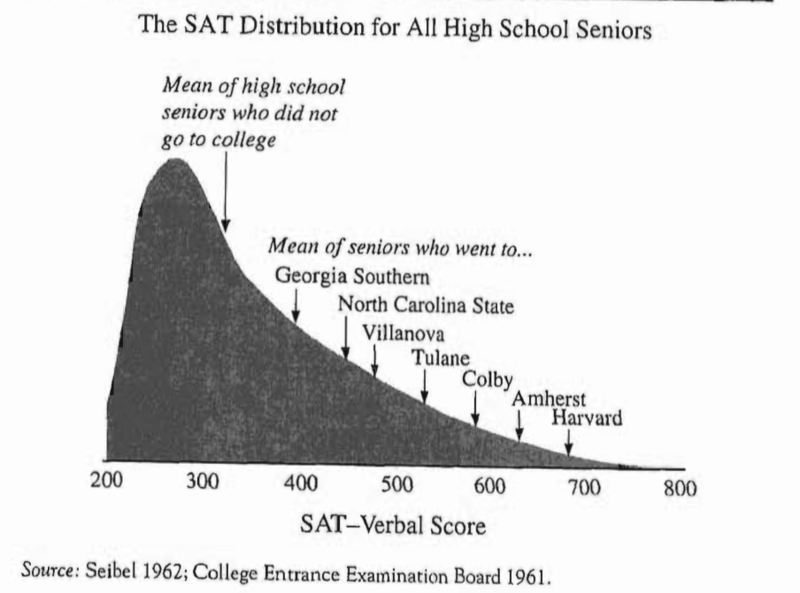 To summarize: SAT and ACT exams are Equated Pre-Test (the content is controlled, compared to previous tests, and standardized to create a test of roughly average difficulty), and Curved/Smoothed/Scaled Post-Test (raw to scaled score conversion tables adjusted) afterwards based upon a more detailed sample of student results on that particular test: if it turns out that the test was harder than expected, then the curve might bump your score up by a few points, and vice-versa, so that the results of the test more strongly resemble a "smooth" bell-shaped curve. 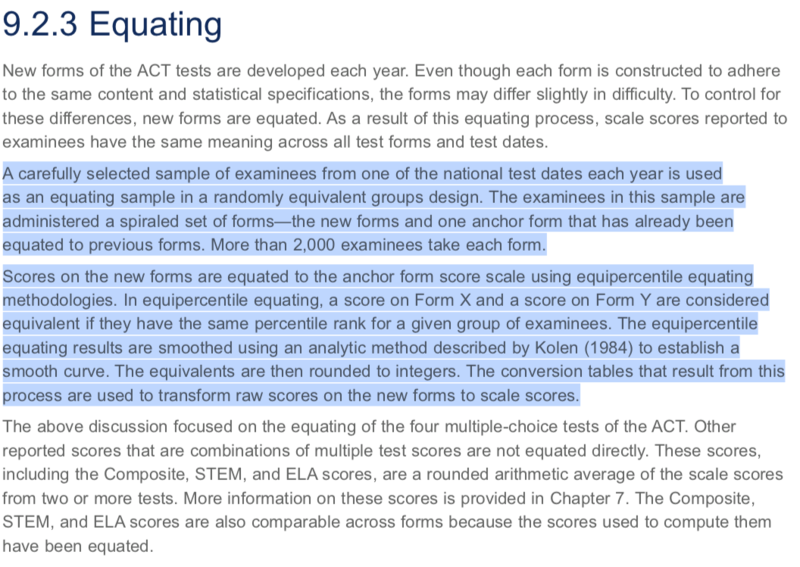 Can I prove definitively that the ACT and College Board engage in curve-fitting/post-smoothing? No, because ACT and the College Board haven't explicitly admitted to it yet. However, we have strong historical evidence (see above), as well as evidence from both the SAT and ACT literature (sources: SAT Technical Manual) / ACT Technical Manual) that curving has been an unstated/largely ignored yet essential part of the "equating" umbrella all along, and that this post-test process is an entirely separate process from any pre-test calculations. 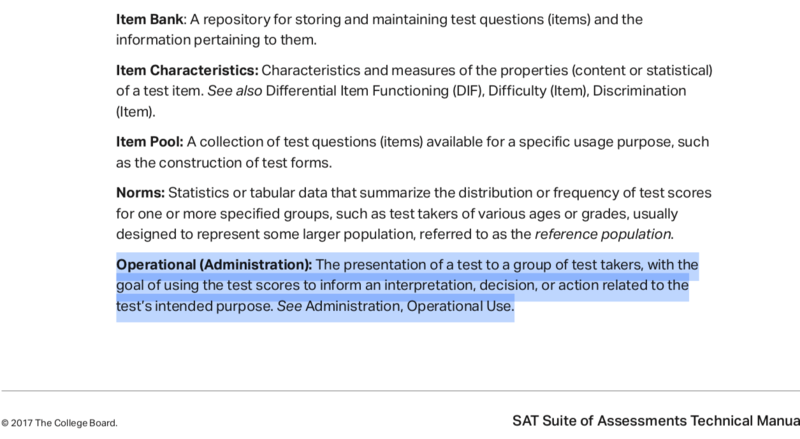 If you read the SAT technical manual, for example, then you will see the term "operational administration," which refers to a national SAT test date when scaling data is collected from a sample group, vs. a "pretest," when equating data is collected prior to the national administration of the test. The ACT also freely admits to using post-test data from national test dates in its technical manual. Finally, it is also important to consider that "curved" tests have a bad reputation, so the College Board and ACT have reason to mislead us in this regard.